LOS ANGELES – It was a sweet, if not nostalgic, reunion of legendary boxing buddies in the history of boxing. 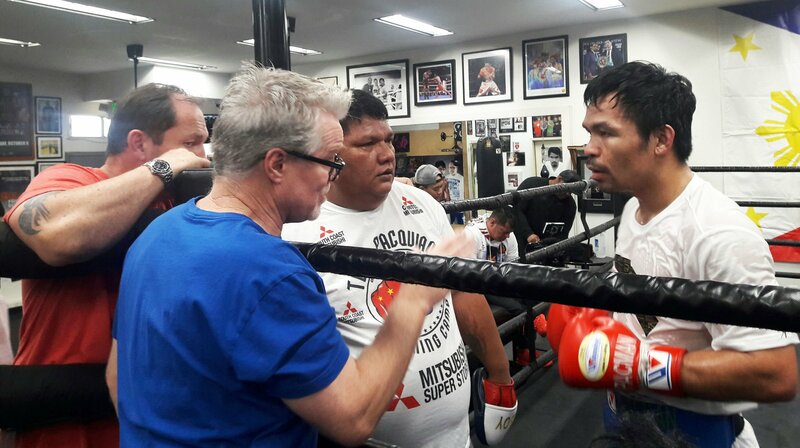 This was what happened Monday afternoon when current World Boxing Association (WBA) Welterweight king Manny Pacquiao returned to train once again at the renowned Wild Card Boxing Gym of Hall of Fame Trainer Freddie Roach. Familiar faces, who helped nurture and hone Pacquiao’s fighting prowess making him the lone eight-division boxing champion of the world, were in attendance – current training supervisor Roach, strength and conditioning coach Justine Fortune, lead trainer Restituto “Buboy” Fernandez, Raides “Nonoy” Neri and Roger “Haplas” Fernandez. The training team was in jovial mood before Pacquiao’s training session kicked off. The Wild Card Boxing Gym along Vine Street here has been home to Pacquiao’s training camps since 2001 when he was chosen as last minute replacement to challenge Lehlo Ledwaba’s International Boxing Federation (IBF) Super Bantamweight crown. The Ledwaba title showdown, which was Pacquiao’s first ring appearance in the US soil, ended in a technical knockout win in favor of Pacman. During the Ledwaba encounter, Pacquiao captivated the heart and imagination of boxing fans worldwide due to his fearless offense and aggressive fighting style. Ledwaba’s knockout defeat served as Pacquiao’s stepping stone towards boxing super stardom. Pacquiao’s stint at the wild Card Gym was interrupted by the Horn’s fight, considered as the biggest broad daylight boxing heist in Brisbane, Australia, in 2017 and the Matthysse championship bout in Kuala Lumpur, Malaysia last July 15 this year. The training camps for both fights were held in the Philippines with the final week of preparation being staged in countries which hosted the event. “We are glad to be back where we first started as a team. I have no problem working with Coach Freddie. We’re sharing inputs and observations to plug every hole or cover all angles to ensure our victory come January 19,” Fernandez bared. During the eight-round mitts’ session on Monday, Pacquiao and his training mainstays – Roach, Fortune and Fernandez – huddled together immediately after every round to further enhance Pacman’s offense, as well as, to check possible chink in his armor. After the punch mitts, Pacquiao pounded the heavy bag for two rounds. He then spent three rounds doing shadow boxing, two rounds hammering the double-end bag and another two rounds hitting the speed bag. Earlier in the day, Pacquiao, together with his eldest son Jemuel Emmanuel, main sparring partner Jorge “The Ferocious” Kambosos, AJ “Mandirigma” Angeles and some other training buddies, scaled the trail of the 1,625-feet Hollywood Mountain. It was Pacman’s first high-altitude run since the training camp for the January 19 Adrien Broner fight started. The next day, Pacquiao will spar against Kambosos and Lydell Rhodes who served as his sparring mate during the two succeeding Bradley fights – 2 and 3.